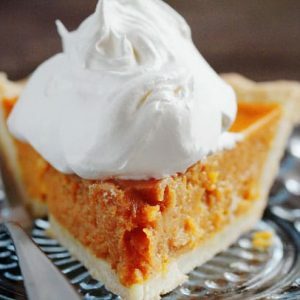 This delicious Simple Pumpkin Pie recipe is quick, easy, and no-fail! Spray a 9-inch pie dish with non-stick spray and carefully fit in pie crust. Pinch edges together with fingers for a decorative edge. Place pie on a baking sheet and bake in the preheated oven for 15 minutes. Reduce heat to 350 degrees F and bake until filling is set, 35 to 40 minutes.